﻿The ﻿most ﻿important ﻿and ﻿pioneering ﻿work ﻿was ﻿done ﻿by ﻿Klaus ﻿J. ﻿Müller ﻿and ﻿his ﻿field ﻿work ﻿already ﻿in ﻿the ﻿1970s. ﻿The ﻿major ﻿amount ﻿of ﻿nodular ﻿limestone ﻿material ﻿yielding ﻿fossils ﻿in ﻿'Orsten' ﻿preservation ﻿came ﻿from ﻿a ﻿quarry ﻿near ﻿a ﻿former ﻿manor ﻿house ﻿Gum ﻿at ﻿the ﻿south ﻿western ﻿edge ﻿of ﻿the ﻿hill ﻿Kinnekulle ﻿at ﻿the ﻿southern ﻿margin ﻿of ﻿Lake ﻿Vänern, ﻿now ﻿a ﻿nature ﻿reserve ﻿and ﻿closed ﻿to ﻿the ﻿public. ﻿More ﻿details ﻿will ﻿be ﻿added ﻿in ﻿a ﻿separate ﻿part ﻿in ﻿due ﻿course. ﻿Remarkably, ﻿no ﻿further ﻿excursions ﻿yielded ﻿major ﻿amounts ﻿of ﻿fossils ﻿with ﻿preserved ﻿"soft ﻿parts" ﻿(exception: ﻿some ﻿material ﻿collected ﻿by ﻿Japanese ﻿colleagues, ﻿but ﻿mainly ﻿unpublished, ﻿see ﻿Maeda ﻿et ﻿al. ﻿2011). 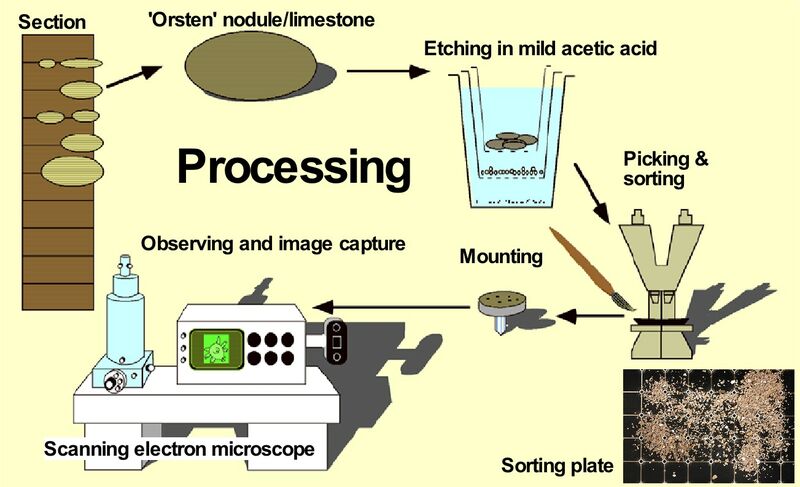 ﻿Again, ﻿the ﻿principle ﻿way ﻿of ﻿how ﻿to ﻿recognize ﻿productive ﻿rock ﻿in ﻿the ﻿field, ﻿and ﻿further ﻿processing ﻿the ﻿rock ﻿was ﻿developed ﻿by ﻿Klaus. ﻿Subsequent ﻿investigations, ﻿however, ﻿were ﻿progressively ﻿advanced ﻿and ﻿modified. ﻿'Orsten' ﻿fossils ﻿are ﻿phosphatized ﻿– ﻿this ﻿is ﻿a ﻿fluoric ﻿apatite, ﻿similar ﻿to ﻿our ﻿tooth ﻿material. ﻿In ﻿the ﻿field, ﻿one ﻿cannot ﻿see ﻿anything ﻿of ﻿the ﻿secondarily ﻿preserved ﻿soft ﻿cuticular ﻿parts ﻿of ﻿or ﻿entire ﻿fossils ﻿– ﻿impossible ﻿due ﻿to ﻿their ﻿size ﻿–, ﻿but ﻿Klaus ﻿used ﻿the ﻿"trick" ﻿by ﻿discovering ﻿the ﻿shiny ﻿phosphatic ﻿shield ﻿halves ﻿of ﻿phosphatocopids. ﻿This ﻿worked ﻿fine ﻿in ﻿southern ﻿Öland, ﻿but ﻿according ﻿to ﻿our ﻿observations, ﻿much ﻿less ﻿so ﻿in ﻿Gum, ﻿for ﻿example. ﻿Another ﻿way, ﻿but ﻿Klaus ﻿was ﻿excellent ﻿in ﻿this ﻿was ﻿to ﻿inspect ﻿the ﻿colour, ﻿size ﻿of ﻿the ﻿crystallites, ﻿and ﻿consistency. ﻿With ﻿this ﻿he ﻿was ﻿able ﻿to ﻿spot ﻿fine ﻿differences ﻿and ﻿could ﻿immediately ﻿recognize ﻿of ﻿a ﻿nodule ﻿or ﻿piece ﻿of ﻿it ﻿would ﻿be ﻿successful. ﻿This ﻿also ﻿worked ﻿with ﻿the ﻿material ﻿we ﻿received ﻿in ﻿Moscow, ﻿where ﻿he ﻿selected ﻿four ﻿small ﻿pieces, ﻿which ﻿yielded ﻿four ﻿tiny ﻿tardigrades, ﻿our ﻿100 ﻿kg ﻿were ﻿just ﻿empty. ﻿The ﻿numerous ﻿calcified ﻿Agnostus ﻿shields ﻿are, ﻿however, ﻿no ﻿indicator. ﻿Dieter ﻿once ﻿collected ﻿'Orsten' ﻿nodules ﻿from ﻿a ﻿road ﻿cut, ﻿but ﻿all ﻿were ﻿just ﻿"empty". ﻿The ﻿entire ﻿process ﻿is ﻿illustrated ﻿on ﻿the ﻿right ﻿side ﻿for ﻿the ﻿method ﻿developed ﻿for ﻿Orsten ﻿material ﻿from ﻿Sweden. ﻿Klaus ﻿has ﻿described ﻿general ﻿aspects ﻿in ﻿several ﻿papers, ﻿which ﻿are ﻿summarized ﻿here. ﻿Material ﻿from ﻿different ﻿areas ﻿may ﻿require ﻿adaptation ﻿to ﻿specific ﻿differences. ﻿The ﻿first ﻿steps ﻿were ﻿done ﻿in ﻿the ﻿so-called ﻿acid ﻿laboratory: ﻿First ﻿the ﻿1-2 ﻿kg ﻿samples ﻿of ﻿nodules ﻿(or ﻿complete ﻿small ﻿orstenar) ﻿were ﻿crushed ﻿to ﻿pieces ﻿of ﻿walnut ﻿size ﻿and ﻿put ﻿onto ﻿sieves ﻿fitting ﻿into ﻿10 ﻿l ﻿household ﻿buckets ﻿filled ﻿with ﻿diluted ﻿acetic ﻿acid. ﻿Klaus ﻿always ﻿used ﻿not ﻿more ﻿than ﻿10%ic ﻿acetic ﻿acid. ﻿He ﻿also ﻿used ﻿some ﻿buffering ﻿to ﻿be ﻿sure ﻿that ﻿no ﻿fossils ﻿are ﻿lost. ﻿Klaus ﻿had ﻿tested ﻿sieves ﻿of ﻿different ﻿size, ﻿but ﻿below ﻿100 ﻿µm ﻿too ﻿much ﻿dirt ﻿(non-animal ﻿material) ﻿remained ﻿on ﻿the ﻿sieves. ﻿Therefore ﻿he ﻿selected ﻿one ﻿coarser ﻿and ﻿a ﻿smaller ﻿sieve, ﻿preferably ﻿of ﻿a ﻿mesh ﻿size ﻿of ﻿200 ﻿µm ﻿and ﻿100 ﻿or ﻿50 ﻿µm ﻿and ﻿left ﻿the ﻿rock ﻿pieces ﻿10-14 ﻿days ﻿in ﻿the ﻿buckets ﻿and ﻿then ﻿washed ﻿the ﻿residues ﻿to ﻿get ﻿rid ﻿of ﻿remaining ﻿acid. ﻿Fossils ﻿in ﻿'Orsten' ﻿preservation ﻿are ﻿extremely ﻿brittle ﻿and ﻿experience ﻿showed ﻿that ﻿phosphatic ﻿matter ﻿became ﻿also ﻿eroded ﻿after ﻿a ﻿while, ﻿so ﻿too ﻿strong ﻿treatment ﻿destroys ﻿all ﻿the ﻿material ﻿= ﻿success ﻿0%. ﻿Thereafter ﻿the ﻿residues ﻿were ﻿dried ﻿and ﻿processed ﻿further. ﻿Other ﻿colleagues, ﻿mainly ﻿the ﻿conodont ﻿workers ﻿used ﻿higher ﻿solutions ﻿– ﻿the ﻿primarily ﻿phosphatic ﻿conodonts ﻿seem ﻿to ﻿be ﻿more ﻿resistant ﻿against ﻿the ﻿acid. ﻿Others ﻿also ﻿put ﻿an ﻿entire ﻿huge ﻿rock ﻿sample ﻿into ﻿a ﻿basin ﻿filled ﻿with ﻿strong ﻿acid ﻿and ﻿left ﻿it ﻿there ﻿for ﻿half ﻿a ﻿year. ﻿Buffering ﻿should ﻿happen ﻿by ﻿the ﻿eroding ﻿surface, ﻿but ﻿to ﻿our ﻿experience ﻿exactly ﻿this ﻿happens ﻿and ﻿would ﻿not ﻿allow ﻿any ﻿fossil ﻿to ﻿survive. ﻿&squf; ﻿coating ﻿of ﻿the ﻿stubs: ﻿the ﻿stubs ﻿were ﻿initially ﻿carbon-coated, ﻿later ﻿gold-coated, ﻿and ﻿placed ﻿into ﻿the ﻿SEM ﻿for ﻿inspection; ﻿use ﻿of ﻿the ﻿turning ﻿and ﻿tilting ﻿units ﻿were ﻿invaluable ﻿tools ﻿for ﻿'Orsten'-type ﻿fossils ﻿because ﻿due ﻿to ﻿gluing ﻿at ﻿least ﻿one ﻿side ﻿is ﻿disguised, ﻿but ﻿one ﻿can ﻿view ﻿the ﻿specimens ﻿from ﻿all ﻿sides ﻿and ﻿directions. ﻿2.b) ﻿organized ﻿working. ﻿Adequate ﻿documentation ﻿is ﻿required. ﻿Another ﻿thing ﻿we ﻿known ﻿know ﻿is ﻿that ﻿limestones ﻿having ﻿yielded ﻿'Orsten'-type ﻿fossils ﻿are ﻿not ﻿necessarily ﻿nodular ﻿like ﻿those ﻿from ﻿Sweden. ﻿The ﻿material ﻿from ﻿Siberia ﻿is ﻿not ﻿nodular ﻿but ﻿layered ﻿and ﻿more ﻿crust-like. ﻿The ﻿material ﻿we ﻿collected ﻿in ﻿Australia ﻿was ﻿from ﻿nodules, ﻿but ﻿these ﻿were ﻿heavily ﻿weathered ﻿and ﻿this ﻿may ﻿have ﻿been ﻿the ﻿main ﻿reason ﻿that ﻿we ﻿failed ﻿to ﻿find ﻿much ﻿many ﻿fossils ﻿in ﻿'Orsten' ﻿preservation. ﻿May ﻿be ﻿even ﻿that ﻿the ﻿hard ﻿grounds ﻿were ﻿the ﻿only ﻿successful ﻿rocks. ﻿More ﻿about ﻿the ﻿Chinese ﻿rocks ﻿and ﻿their ﻿specifities ﻿will ﻿be ﻿added ﻿in ﻿due ﻿course. 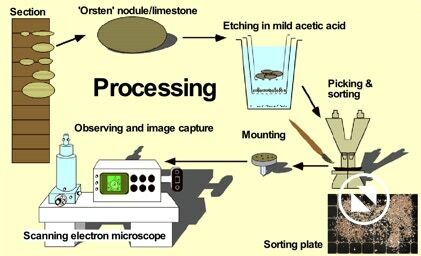 ﻿Investigation ﻿of ﻿'Orsten' ﻿fossil ﻿may ﻿also ﻿need ﻿some ﻿considerations: ﻿First ﻿of ﻿all, ﻿by ﻿light ﻿microscopy ﻿stage ﻿of ﻿processing ﻿the ﻿material, ﻿one ﻿cannot ﻿even ﻿identify ﻿if ﻿a ﻿fossil ﻿is ﻿well ﻿preserved. ﻿Such ﻿fossils ﻿are ﻿not ﻿only ﻿tiny, ﻿but ﻿shiny ﻿and ﻿appear ﻿to ﻿look ﻿nice, ﻿details ﻿cannot ﻿be ﻿seen ﻿very ﻿well. ﻿Yet, ﻿as ﻿you ﻿may ﻿see ﻿from ﻿the ﻿left ﻿images ﻿below, ﻿the ﻿ventral ﻿details ﻿of ﻿the ﻿body ﻿and ﻿limbs ﻿of ﻿this ﻿larval ﻿phosphatocopine ﻿are ﻿ill-preserved, ﻿only ﻿the ﻿soft ﻿membrane, ﻿inner ﻿lamella ﻿that ﻿spans ﻿between ﻿out ﻿shield ﻿rim ﻿and ﻿body ﻿appears ﻿nice. ﻿We ﻿uphold ﻿that ﻿investigations ﻿are ﻿largely ﻿restricted, ﻿so ﻿far, ﻿to ﻿scanning ﻿electron ﻿microscopy ﻿SEM ﻿– ﻿"our ﻿eye" ﻿on ﻿this ﻿minute ﻿world. ﻿Lastly ﻿a ﻿word ﻿to ﻿accuracy: ﻿The ﻿sorting ﻿process ﻿under ﻿a ﻿microscope ﻿is ﻿time-consuming ﻿and ﻿should ﻿be ﻿done ﻿very ﻿carefully ﻿by ﻿skilled ﻿persons. ﻿People ﻿not ﻿trained ﻿in ﻿differentiated ﻿viewing ﻿will ﻿not ﻿find ﻿much ﻿under ﻿the ﻿microscope. ﻿Klaus ﻿was ﻿extremely ﻿focused ﻿on ﻿and ﻿successful ﻿in ﻿finding ﻿persons ﻿for ﻿this ﻿duty. ﻿He ﻿also ﻿let ﻿the ﻿limestone ﻿pieces ﻿being ﻿cleaned ﻿from ﻿recent ﻿dirt ﻿and ﻿contamination, ﻿yet ﻿he ﻿could ﻿not ﻿avoid ﻿that ﻿his ﻿assistants ﻿picked ﻿pieces ﻿of ﻿extant ﻿plant ﻿and ﻿animal ﻿material, ﻿mainly ﻿insects ﻿and ﻿mites, ﻿and ﻿glued ﻿them ﻿onto ﻿the ﻿stubs. ﻿Frequently, ﻿also ﻿a ﻿subsequent ﻿contamination ﻿with ﻿plant ﻿hairs ﻿from ﻿the ﻿room ﻿flowers ﻿occurred.